AAPL stock continues to tick higher to its destiny, but the enthusiasm is very much priced-in. At this rate, it’s almost an inevitability. Barring extremely unusual circumstances, Apple Inc. (NASDAQ:AAPL) will become the first company ever to hit $1 trillion market capitalization. No one, not Amazon.com, Inc. (NASDAQ:AMZN), not Facebook, Inc. (NASDAQ:FB), can lay claim to that title. And at slightly over $187, Apple stock just needs to push a little bit more to get there. Needless to say, $1 trillion is a huge deal. First, the margin between Apple stock and its next-closest rivals is massive. Amazon, at $784 billion, occupies the runner-up position. Microsoft Corporation (NASDAQ:MSFT) lies in a tight third place at $748 billion, while Alphabet Inc (NASDAQ:GOOG,NASDAQ:GOOGL) is in a respectable fourth place at $755 billion. The other factor to consider is that Apple Inc. will soon have a market value that exceeds many countries’ GDP. And I’m not talking about no-name countries here! Should Apple stock hit that trillion-dollar mark, it will exceed Netherlands’ GPD by nearly 6%. From there, Indonesia and Mexico are within realistic striking distance. As our own Bret Kenwell articulates, AAPL stock could continue rising up the charts. Big whales, most notably Warren Buffett, are huge Apple Inc. fans. Buffett’s Berkshire Hathaway Inc. (NYSE:BRK.A, NYSE:BRK.B) recently acquired 75 million shares, bringing its total ownership to approximately a 5% stake. While it’s not the end-all, be-all, Buffett’s presence certainly inspires confidence. Not only that, the company’s valuation is insane. Kenwell writes that Apple stock “now trades at just under 16 times this year’s earnings and about 14 times next year’s estimates.” In comparison, Microsoft and Alphabet trade in the upper 20s. Amazon, for all its greatness, balloons at 253 times trailing earnings. Apple Inc. can’t go wrong. Not to jinx it, but this is usually when things do. Apple Stock Will Hit $1 Trillion, but Then What? Before I get hit with a wave of angry emails, let me just make one thing clear: I’m not saying that Apple Inc. will fail to hit the buzzer. With such a small gap to cover, the consumer electronics giant can be a trillion-dollar firm before the weekend. My question is, what will happen next? The danger is that most investors may not know. It’s fun to watch Apple stock tick higher, with each basis point drawing the inevitable closer. But the buyers at this price should have some expectation in mind. Do they anticipate a $2 trillion company 30 years down the road? If so, what’s the rationale? While AAPL stock has the most legitimate opportunity, this isn’t the first time people anticipated a trillion-dollar company. Back during the dot-com bubble, experts predicted Cisco Systems, Inc. (NASDAQ:CSCO) would bring home the goods. It got a little over the midway point before collapsing. Investors learned right quick that a pound of anticipation isn’t worth an ounce of reality. And what’s the reality for Apple stock? The competition has already closed in on the once untouchable company. Many people know that Samsung Electronics dominates global smartphone market share. What they may not realize, though, is that Samsung was neck-and-neck with Apple back in 2011. The following year, Samsung decisively took the lead and never looked back. Indeed, since 2012, we’ve only seen two quarters where Apple led market share over Samsung, and the margins were tiny. In all other quarters, Apple has fallen behind Samsung to the tune of nearly 40%. 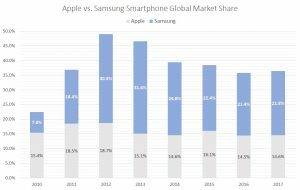 The other problem I have is that Apple and Samsung’s combined market share has decreased over the past six years. Low-cost competitors are entering the sector, and winning over customers. If any company meets the definition of “priced-in,” it has to be Apple Inc. With Steve Jobs tragic passing, Apple desperately needs a gamechanger, not multiple rehashes of yesteryear technology. To be fair, the iconic firm currently levers exciting businesses, such as their “Services” department. As Kenwell points out, this unit alone generated $9 billion in the most recent quarter. But Services won’t have anyone to serve without flagship product sales. Unfortunately, all signs indicate that corporate and industry-wide smartphone sales are stagnating. I suppose you could buy Apple stock anticipating that they’ll release something worthwhile. To me, that’s a huge risk. Aside from the iPhone X, the company doesn’t generate much awe-striking excitement. For instance, worldwide iPad sales peaked in 2014. Their wearables are a different story, but it seems a matter of time before they too fall under pricing competition. Although I want to believe that AAPL stock has much more upside remaining, I just don’t see it. Buying into the trillion-dollar craze seems awfully risky, especially at this stage. The smartphone market is saturated, as is the tablet market. 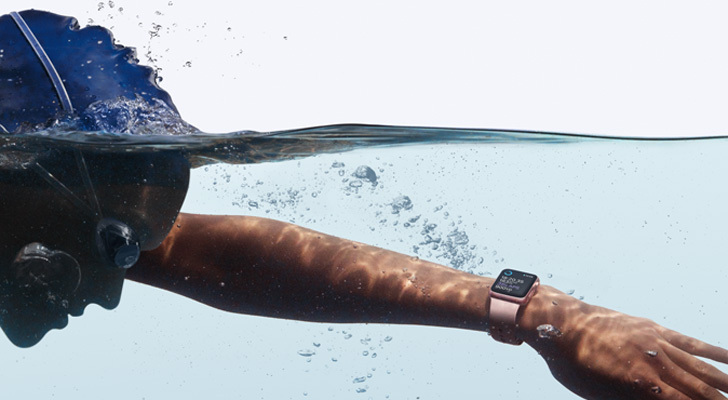 Once the wearables sector peaks, where does Apple go? Management could figure it out, but I don’t want to risk my money while they do. Article printed from InvestorPlace Media, https://investorplace.com/2018/05/trillion-dollar-apple-stock/.